In a consultative ballot that closed at 12 noon today (Friday 12th October), Unite members employed by Bilfinger, Semco, and Wood have overwhelmingly voted for an industrial action ballot, to secure a bonus on the Total Culzean project. 100% of members on a 81% return have indicated that they are willing to take industrial action. Total believe they can just impose something, and it will be accepted. This result shows they are wrong. Our members on the Culzean project have shown in this ballot, that they want a fair and substantial bonus. Total and the three contractors, Bilfinger, Semco and Wood, need to come to the table and negotiate a bonus that will be acceptable to our members or risk industrial action. The oil and gas sector shouldn’t be quick to draw a link between mental health issues and offshore rotas, an industry employment expert has said. Alix Thom, skills and employment issues manager at industry body Oil and Gas UK (OGUK), said three-week, equal time rotas had been around for years – and that while many dislike the schedule, there are those who would keep it. Ms Thom’s comments come amid a renewed call for action on the rotas following a mental health pledge from North Sea operators. Energy giants BP and Shell are among those to have signed up to the Time to Change campaign, aimed at ending mental health discrimination in the workplace. The Unite trade union welcomed the initiative, but urged operators to go a step further and work with contractors to move away from three on, three off (3/3) shifts. Changes to 3/3 rotas were widely reported during the oil sector downturn as operators tried to cut costs. A report in April from Robert Gordon University said those on 3/3 shifts are twice as likely as those on a 2/2 to experience ill health. BP, which runs a 3/4 and 3 /5 pattern, said the findings of the RGU report would be reviewed by BP, along with members of the Offshore Contractors Association (OCA). The firm also runs an employee assistance programme, designed to help workers 24 hours a day with daily challenges, including personal health. Operators cannot always determine which shifts are assigned to contractors on their rigs. Energy Voice recently revealed Shell was considering changing its shift patterns as part of a wider review to make its operations “sustainable and competitive”. Contractors on Shearwater are understood to have a 3/3 schedule, though Shell employees work to a 3/4 rota. A leaked report by a safety representative on Shell’s Shearwater platform said new shift patterns had left workers’ partners “struggling with home” life, with some being diagnosed with depression. But Ms Thom said that while it can’t be discounted as a contributing factor to mental health issues, 3/3 rotas are not the whole picture. She said: “The drilling community has been operating on a three and three basis for years. “A number of organisations changed their rota in response to very difficult business conditions as a result of the downturn which began in 2014. We can’t shy away from the fact that a number of people are unhappy working it. We are, of course, aware of some people who do like it. “I don’t think I would draw a direct correlation between working a 3/3 rota and developing mental health issues. Shift patterns will be just one of a number of things affecting mental health. “It is an issue growing in awareness. Our members are aware that mental health is an important aspect of their workforce so it’s not a new consideration for our members. “I think there are a number of companies that have signed up to the Time to Change campaign. The onshore workforce has also been through a very difficult time. It’s a way more complex picture than something that was to do with 3/3 rotas. Ms Thom added that shift patterns are a decision for individual companies who may use different rotations for reasons, including the distance to offshore platforms. A spokesman for BP said: “BP is committed to changing how mental health is viewed in our workplace and support employees who may be facing problems. Our Time to Change pledge is just one part of this. “Throughout the year, we hold a range of events and employee engagement sessions which provide opportunities for people to talk openly about mental health, whether that’s their personal experiences or the experiences of others. “We also offer a number of resources online so that people who have a fairly busy work and home life can access information in their own time. In addition, BP provides a free and confidential Employee Assistance Programme (EAP) designed to assist employees 24/7 in managing life’s daily challenges, including personal health. “A manager or co-worker can also call the EAP, in confidence, for guidance how to start a conversation with a colleague they are worried about. Unite regional organiser Tommy Campbell said: “Unite welcomes this pledge by BP and hopefully all other major oil and gas companies follow this good example too. “However we would ask that BP work constructively with the Offshore Contractors Association employers and unions to move away from 3/3 rosters in light of the RGU survey highlighting the adverse effect on offshore workers mental health and wellbeing. “BP might have a set rota for its own staff but there are people on their assets that BP needs to be in conversations with. “If there are better rotas that BP deploys for their own employees then it would be welcome if they were to support the contractors that they hire to operate similar rotas that are better for the workforce. 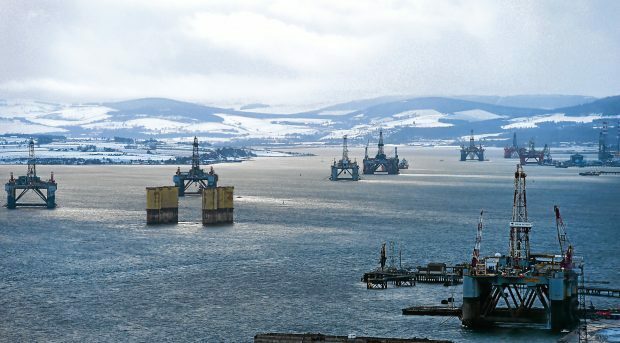 The oil rig twins, Ocean Princess (left) and Ocean Nomad (second left) in the Cromarty Firth. Offshore rota changes are taking their toll on the mental health of North Sea workers and their families, a leaked report suggests. The switch to three-week, equal-time rotas has left workers’ partners “struggling with home life”, with some even being diagnosed with depression. And problems at home are resulting in crew members being “distracted and not fully focused on the job at hand”, according to the report. North Sea operators and contractors switching to “three on, three off” rotas in a bid to lower costs was widely reported during the oil sector downturn. It means the concerns raised in the report are likely to apply to a sizeable number of platforms on the UK continental shelf. The move was widely condemned by trade union officials, who warned that spending three weeks at a time offshore, instead of two, would have dire safety implications. The report, seen by the P&J’s sister publication Energy Voice, was written by a safety representative on Shell’s Shearwater platform in the central North Sea, 140 miles east of Aberdeen. Its author said morale on the platform was “at an all-time low” and that workers felt Shell was winning a “race to the bottom” within the industry. It called for the Anglo-Dutch oil major to look into the complaints and “establish itself as a leader” in dealing with health and safety issues. A spokesman for Shell said the firm took the safety of crew “very seriously” and that it worked closely with safety representatives. It is understood contractors on Shearwater have a three on, three off schedule, though Shell employees work to a three on, four off rota. It is unclear whether the safety representative is a contractor or a Shell employee. “The workforce is now feeling a sense of dread in the week prior to returning offshore with partners saying they don’t know how they are going to cope,” the report found. The report also said people were becoming “more argumentative and withdrawn within the working environment”, while “instances of being foul tempered with family upon returning home” were also noted. Furthermore, staff members fear being put at “the top of the list for the next round of redundancies” if they are identified as having mental health issues, according to the report. It is understood Shell currently has no redundancy plans. Steve Phimister, upstream vice president for the UK and Ireland at Shell, said in December that the company was fitter and ready to invest in the North Sea after taking steps to turn around the business. Shell’s spokesman said: “We take the safety and welfare of all personnel who work on our assets very seriously. “We acknowledge that offshore personnel have experienced change over the last few years and we will continue to engage with and listen to our workforce on matters they raise with us. “We work closely with our safety representatives on an ongoing basis. Wreckage from the Super Puma crash in Norway, 2016. Safety checks introduced in the wake of the 2016 tragedy are being extended to certain models of aircraft currently operating in the North Sea. Meanwhile, footage has emerged of a recent crash in South Korean, in an eerie reminder of deadly accidents in the UK. France-based Airbus has said systems which can help detect gearbox wear and tear need to be inspected more often on the increasingly popular H175 model. And the manufacturer has ordered the replacement of those systems on H155 helicopters, which have been used for oil rig flights in small numbers. Airbus’ spokesman said the application of upgrades across its global fleet showed its “commitment to continuous improvement”. He said the measures included the use of “improved monitoring and detection systems” and were supported by Europe’s aviation watchdog. Thirteen people died near Bergen in April 2016 when the rotor on a Super Puma detached. Iain Stuart, 41, from Laurencekirk, was among the victims. Super Pumas were swiftly grounded, but aviation authorities in the UK and Norway infuriated trade unions in July 2017 when they lifted the flight ban. The watchdogs said the aircraft could not return to action until certain modifications and upgrades had been made. They are yet to return to the North Sea. Concluding their investigation in July, Norwegian authorities said the rotor broke off due to a “fatigue fracture” in a “second stage planet gear” in the main rotor gearbox. They said the fault was “probably” caused by tiny pieces of debris wearing away at the component. Airbus said the crash was “unpreventable”, despite similarities with a fatal accident that killed 16 people near Peterhead seven years earlier. Also last month, the rotor detached from a South Korean military helicopter shortly after take-off, resulting in five deaths and one injury. The incident involved a helicopter designed by Korea Aerospace Industries (KAI), with some gearbox components supplied by Airbus. It is unclear whether those components contributed to the equipment failure. A video of the incident appears to show at least one of the blades wobbling and breaking before the rotor came off. Mr Campbell said: “Unite is very saddened to hear of the loss of life in another helicopter accident in Korea. Airbus declined to comment on the incident in South Korea. Trade union Unite has announced it will ballot its members on a revised pay offer on Equinor’s Mariner platform. The union confirmed yesterday that a new offer had been tabled by oil field service firm Aker Solutions and that its membership had agreed to remove an overtime ban as a gesture of “good will”. Unite also said the new offer “addresses a number of key concerns” raised in the successful ballot for industrial action including training, turnable beds nightly allowance, standby and bonus payments. A fresh vote on the offer will take place on August 13. Some 83.4% of Unite members on a 80.1% turnout voted to reject the previous offer. Unite regional officer John Boland said: “There has been significant movement by Aker management over the last week to address a number of the key concerns our membership had which led to an overwhelming mandate for industrial action. These latest negotiations have been conducted in a constructive way which led to Unite making the decision to remove the overtime working ban as a gesture of goodwill. Crew on the £4.5 billion project downed tools for eight hours in an ‘unofficial strike’ on April 7 in a dispute over pay and working conditions. They are believed to have declined to work overtime the following day. Trade union sources suggested a lack of accommodation had led to unfavourable changes in shift patterns. Meanwhile, strike action continued yesterday on North Sea platforms operated by French oil giant Total. Workers voted to down tools in a series of 24-hour and 12-hour strikes. Last Monday, 24-hour strikes halted production on the Alwyn, Dunbar and Elgin. Further 24-hour stoppages will take place on August 6 and August 20 with an additional 12-hour stoppage on August 13. The latest production data on the Oil and Gas Authority’s website indicates the three fields pump out more than 70,000 barrels of oil equivalent per day combined. Unite regional officer Wullie Wallace confirmed “no talks” had taken place with Total. Please see below messages of support for the Unite TOTAL members and to all union members who have taken or are in the process of organising Industrial Action/Strike Action in the North Sea to win for workers. A message of support from John Gillespie, Chair of Unite Scotland. Unite the Union Scotland Organisers, Officers and Staff send a message of solidarity and support and will assist all the brave and comradely actions that Unite members and sister offshore trade unions during any Industrial dispute, which Unite members have to take to win and protect existing terms and conditions. You may not always win – however if you don’t fight you will never win any industrial struggle. collectivising your fellow work colleagues is the only way you can win. Message from Denise Christie, FBU. I am writing to you to provide you all with a message of solidarity from Unite members in NHS Ayrshire & Arran. I am always dismayed when workers have to take the ultimate sanction of strike action for it means that employers have failed in their attempts to address the needs of workers. In this instance, it is even worse as this is clearly a health and safety issue with the employer changing a shift pattern with no cognisance of how their actions will adversely affect the health, safety and wellbeing and work/life balance of the workforce. Everyone at Branch SC/157/NHS Ayrshire and Arran wish you well in your struggle to take on an employer who appears to have little regard for you and we salute the brave stance which you are taking. If there is anything we can do to support you in any further way then please let me know. Trevor Cox All the best from Unite Newcastle Construction Branch. John Bowman Good luck from York and District RMT. Solidarity from The Peoples Assembly Scotland to the Unite Scotland off-shore members currently on strike on the North Sea oil and gas platforms operated by Total E&P. A message of solidarity from the Brent Bravo. With you all the way! ‘Wish you all our support in your forced Action. Solidarity.